Where is the Rottweiler breed from? Well we know they are from Germany, and originally Rome, so what on earth is an American Rottweiler and how can you tell whether your own Rotty is German or American? Well read on because, though slight, there are some differences between the two and we are going to look at them right here. Rottweiler origin certainly brings forth common arguments between the fanciers of the breed. Sometimes they even quote that a dog may or may not have the right size head or body length, or that their legs are too long or short. So what exactly is the difference between a German or American Rotty? Through research, I have discovered that there are actually several standards as far as the Rottweiler is concerned. First and foremost, a German Rottweiler is defined as German for simply being born in Germany. If your Rottweiler was originally born in Germany, you can safely assume that your Rottweiler is defined as a German Rottweiler. 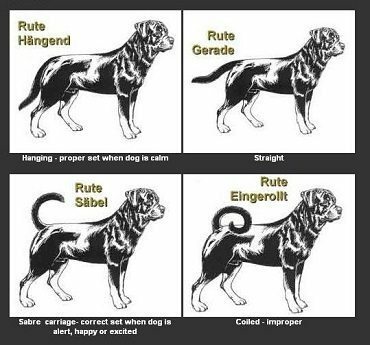 But that is not the only thing you must consider when defining a German Rottweiler. The Allgemeiner Deutscher Rottweiler­-Klub (ADRK) does have very strict standards for the breed. The ADRK also wants their dogs to be well suited in assisting their human companions. This means they must have a mild and calm personality, as well as a sharp mind. The ADRK wants their Rottweiler to be compatible for use as companion dogs, guide dogs for the blind and or disabled, security dogs, working dogs, and family dogs. That is why they have such strict guidelines where temperament is concerned. They want the Rotty to be a perfect companion or bombproof working dog. The ADRK has a very strict no docking rule. 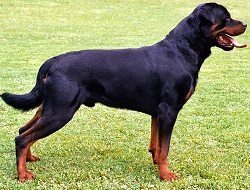 They will not consider a dog an ADRK recognised Rottweiler if they have a docked tail. Tail docking is the intentional removal of the animal’s tail, which is generally done by snipping off the tail with surgical scissors, or by using a special band to cut off the blood flow, causing the tail to fall off. The American Rottweiler is a breed of Rottweiler that’s origin is based in America. So the American Rottweiler was born in America, not in Germany. There are many similar characteristics between the two. 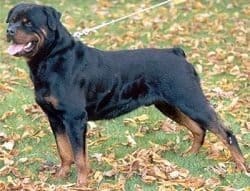 The main differences seem to be what the American Kennel Club (AKC) requires for the breed as opposed to the requirements of the Allgemeiner Deutscher Rottweiler­Klub (ADRK).The AKC also allows tail docking, where the ADRK does not. Is My Rottweiler German or American? As you read, there is very little difference between the two breeds. 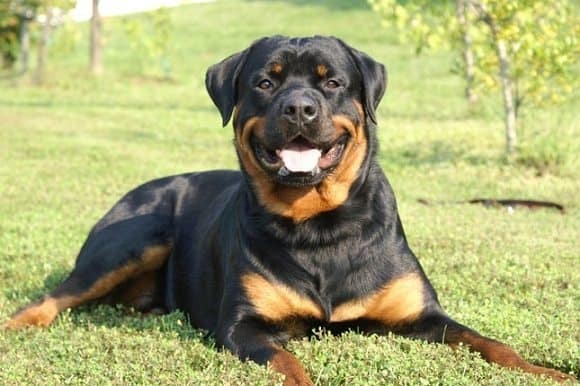 Most of the differences are defined by the AKC and ARDK having different values and ideas as to what is acceptable for the breed to be recognized as a Rottweiler. The Allgemeiner Deutscher Rottweiler­-Klub is very concerned with the temperament of the dog, and are also sticklers on the size and weight of the dog. The German Rottweiler is generally a slightly larger dog, even if only by centimeters, and will not have a docked tail. The American Kennel Club recognises a slightly smaller dog with the signature docked tail. But all these things considered, what really defines your Rottweiler as German or American is simply where your particular companion came from. If your Rottweiler was born in Germany, then they are indeed a German Rottweiler. If they were born in America, they are an American Rottweiler. All in all, they are a hardy breed with a sweet disposition that when bred well makes a great working dog and pet. Hey Briana, thanks for stopping by! Well, albino rotties are pretty rare but there’s nothing wrong with them. There’s a similar issue with long haired or red rotties. People tend to think that there’s something wrong with them or that they are not purebred, but the fact is that they are only really rare.